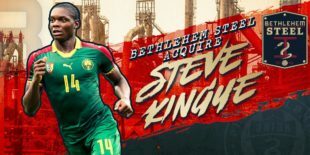 Bethlehem Steel FC announced Friday it has acquired just-turned 19 year-old Cameroonian youth international defender Steve Kingue on loan from Nfuko Academy Sports in Cameroon. Kingue (pronounced KIN-gay) is from Yaounde, Cameroon, as is Faris, and turned 19 two days ago. Transfermarkt lists his primary position as central defender and his primary foot as his right. He is the second central defender to come to Steel FC for the 2019 season. The club lists him as 6’1″ and 170 pounds, so not only does he share Yaounde with Faris, he is also of comparable size. His physical arrival in the States will depend upon the speed with which he receives his P1 visa, a process that has seemed slower this year than in years previously. Receiving the document will determine whether he joins the club in Florida or back here in Philadelphia after they return. Kingue was on loan last year as an 18-year old with JK Tallinna Kalev in Estonia’s capital city on the south coast of the Gulf of Finland. He made 18 appearances with 16 starts and scored 4 goals across all competitions. His Estonian loan, also from Nfuko Academy Sports, was set to run to June 30, 2020, suggesting that Ernst Tanner liked what he saw and made the Cameroonian academy a better offer. Transfermarkt values him at 50 thousand Euros as of November 14 last year. Kingue will wear number 43 for Bethlehem. Any word if there is an option to buy? There would have to be right? Mcb, it is an excellent question and I don’t know the answer. Borek Dockal’s loan had no option to buy, so your question is real. The news broke late Friday afternoon. I intend to find out next time I chat with coach Burke, if he will tell me. Now that shutdown has ended hopefully visa paperwork can go through but can’t see it being done earlier than mid_February due to backlog. Sounds like cool pickup for Steel. I disagree slightly with El pachy___yes steel serves as farm team but I think roster needs more than just academy kids at least for near future. Smart move. Defender with goals under the belt, my type of defender. All 11 on field should be attack_minded and offensive threat. Thanks for sharing, Tim, and welcome Steve.